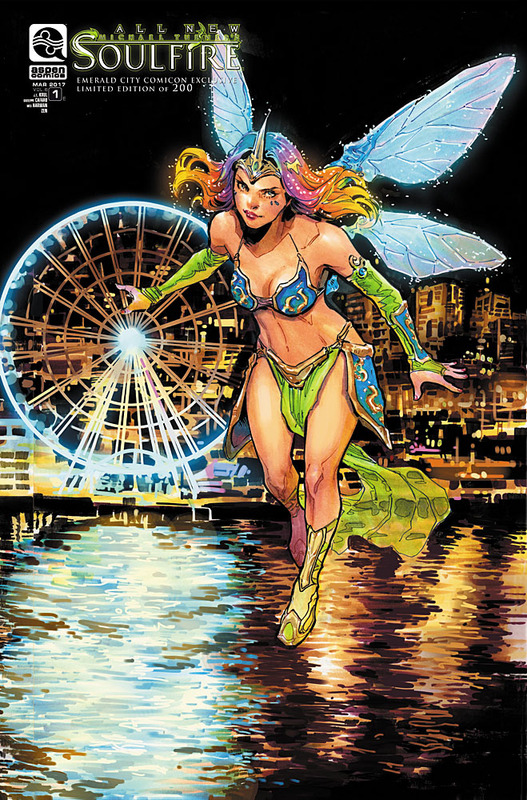 Aspen Comics has revealed their full line-up of exclusive items available at this year’s Emerald City Comicon 2017 at the Aspen Comics Booth #1501. Aspen will be launching their all-new Aspen YOU-niverse Bundle package that will include several exclusive items in addition to others debuting in the bundle. 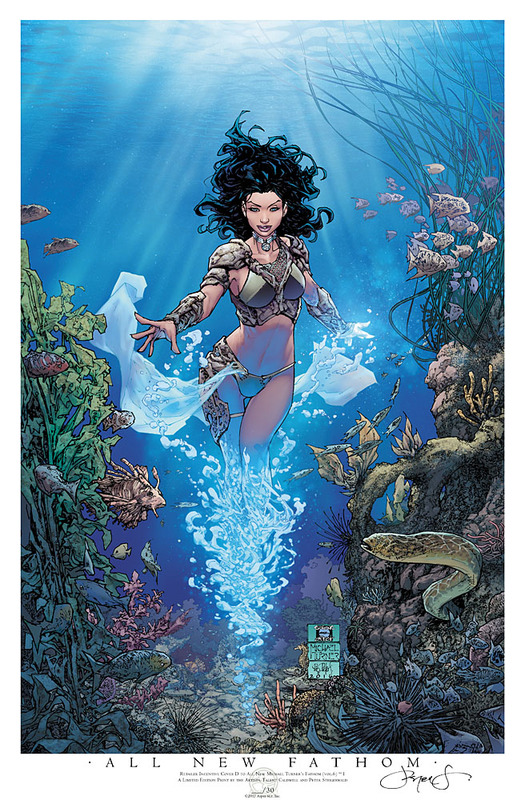 The first ever, all-new Aspen Comics YOU-niverse Bundle will include an exclusive Michael Turner’s Fathom #1 line-art variant cover by creator Michael Turner. 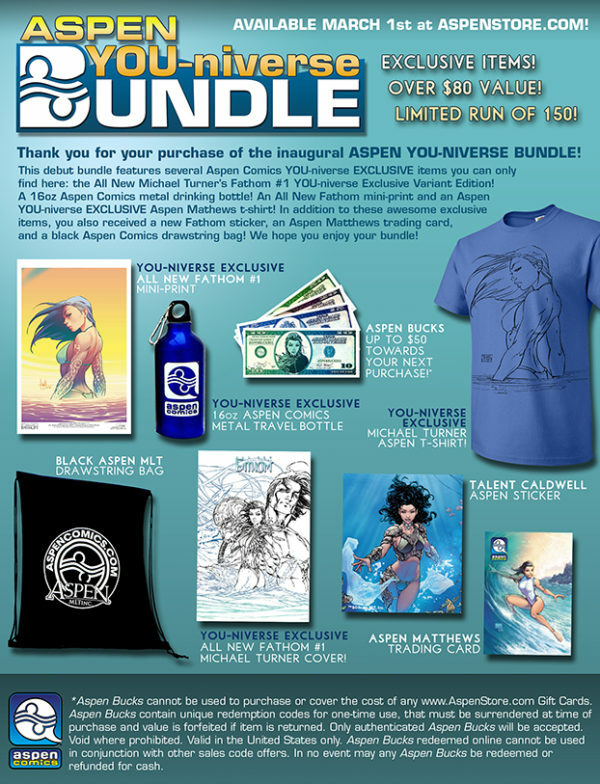 The bundle also includes an exclusive Fathom T-Shirt, a metal travel bottle, a Fathom mini print by Michael Turner, with colors by Peter Steigerwald, a new Aspen sticker, a Fathom trading card, Aspen Bucks available for use in person at the Aspen Comics Booth #1501 or on www.AspenStore.com, and an Aspen Comics drawstring bag to complete the bundle. 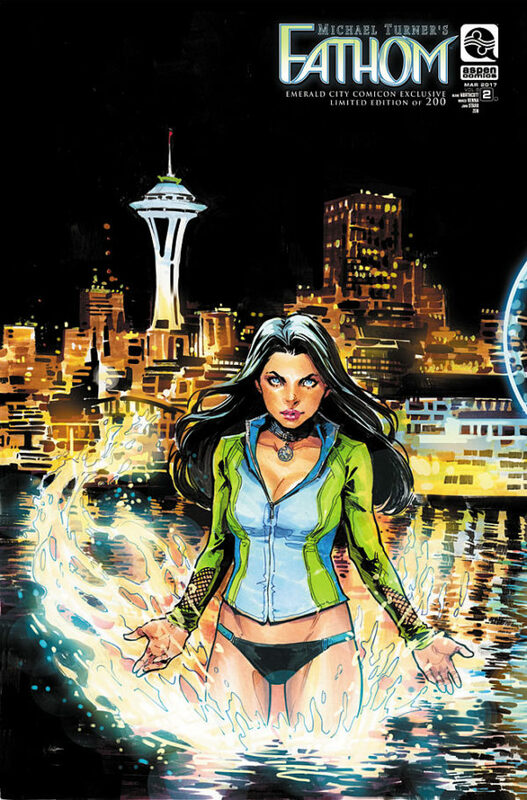 The publisher will also be debuting the first issue of Michael Turner’s Soulfire featuring a connecting cover by Seattle native, Siya Oum, and the second connecting cover for All-New Fathom #2, both available at the Aspen Comics Booth #1501 and limited to 200 copies. 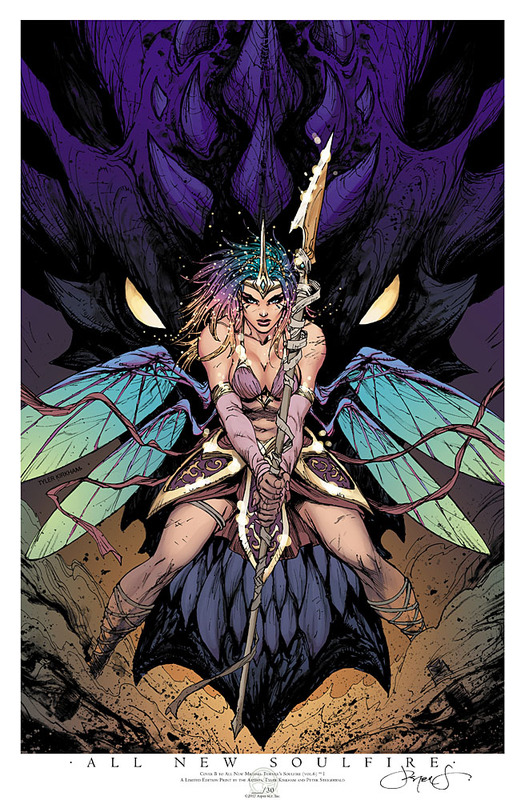 Aspen will also be releasing a new series of ECCC 2017 exclusive prints including Fathom and Soulfire by artists Tyler Kirkham, Talent Caldwell and Siya Oum, all three available at the Aspen Comics Booth #1501. Creators Frank Mastromauro (Shrugged, Overtaken), Peter Steigerwald (The ZooHunters, The Dark Knight Returns: The Last Crusade), Siya Oum (Lola XOXO), Heather Finley (Executive Assistant: Iris Annual) and Tom Hutchison (Big Dog Ink) will be appearing at the Aspen Comics Booth #1501 throughout the weekend.